The making and flying of kites is a tradition in China that goes back thousands of years. In Europe the first definite mention is as late as 1589. One of the earliest uses of kites was in fishing, the kite would trail a line with hooks and bait allowing the kite-flier to fish in areas some way out from land over rivers or the sea. An early legend about the origin of the kite is that the philosopher Mozi (d. 380BCE) built a kite made of wood in the form of an eagle near Mount Lu in Shandong. Later on the kite was made much lighter when silk and bamboo replaced wood. The invention of fine paper in China made kites cheaper and easier to build. There is an ancient legend about Huan Jing ➚ who was told by the soothsayer Fei Jiangfang (費長房) to flee to high land to escape disaster on the double ninth Chongyang festival and drink wine in which chrysanthemum petals had been soaked. He did as he was told and he avoided an infectious plague and kite flying became part of the an annual festival held on that day each year. Kites were used in Chinese battles; a very large kite can be made strong enough to lift a soldier into an enemy town; while others were used to drop propaganda leaflets into besieged cities. General Hanxin (c. 231-196 BCE) ➚ used kites to measure the distance to enemy walls so that guns could be targeted and tunnels could be excavated to the correct distance. He flew a kite higher and higher until the shadow of the kite just hit the wall, by measuring the length of kite string and the angle of the sun he could calculate the exact distance to the town. Emperor Wenxuan of the Northern Qi dynasty (526-55) aka. Gao Yang, carried out experiments in large kites to raise men off the ground. This is the first documented example of manned flight. Unfortunately the details are a bit more gruesome, as the fliers were prisoners who had no choice in the matter and Gao Yang is reported to have been entertained by the many failed attempts at flight. However it is said that one person did manage to fly for two miles using a kite. To lift such a weight it is likely that the Chinese developed surface shapes similar to aircraft wings. Kite flying at times has been an Imperial pastime, Emperor Xuanzong of the Tang dynasty is known to have loved to fly them. By tradition, it is considered bad luck to lose a kite or pick up one that has been lost. If the kite string is cut then bad luck was considered to fly away with the kite. The passion for kite flying has spread from China to all parts of Asia. 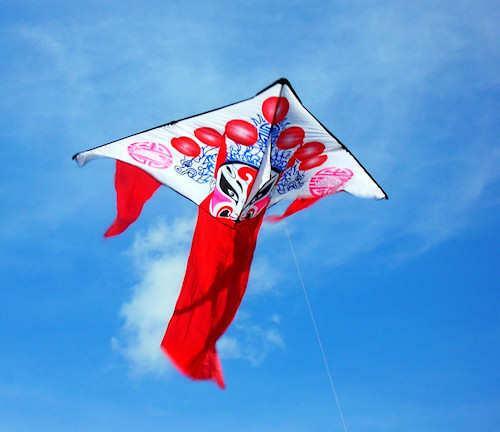 There is a large range of different designs of kites, some are 3 dimensional rather than flat and often are made in the form of creatures such as: birds, bats and dragons. The size of kites varies enormously, the tail can be several hundred yards long. Most designs use a basic frame made from bent bamboo. In the parks you will often see people flying kites. The traditional kite flying season starts on the Chongyang festival held in October. At the Qingming Festival kites were flown to send messages to departed loved ones. Tianjin and Weifang ➚, Shandong are two cities particularly associated with kites, they hold annual competitions that attract enthusiasts from many countries. For a lovely web page showing 99 kite designs you can visit the University of Maine web site ➚. Citation information for this page : Chinasage, 'Kites in China', last updated 5 Apr 2019, Web, http://www.chinasage.info/kites.htm.